Make life intolerable and death likely. Open an escape route, or offer a deal to those who leave or surrender. Let people trickle out. Kill whoever stays. Repeat until a deserted cityscape is yours. But in the past few days, as hopes for a revived cease-fire have disintegrated at the United Nations, the Syrians and Russians seem to be mobilizing to apply this kill-all-who-resist strategy to the most ambitious target yet: the rebel-held sections of the divided metropolis of Aleppo. The killing and destruction in Syria, of course, has stupefied much of the world over the past five years. But it could pale in comparison with a military assault to retake all of Aleppo, once Syria’s largest city and still home to about two million people, roughly 250,000 of them in rebel-held territory. A takeover battle could mean “a slow, grinding, street-by-street fight, over the course of months, if not years,” the United Nations special envoy for Syria, Staffan de Mistura, warned on Sunday, speaking at an emergency Security Council session on Syria, in which outright confrontation replaced any effort to find diplomatic common ground. East Aleppo would be by far the biggest and most fortified area that government forces had sought to retake with scorched-earth tactics of siege and bombardment — called “starve-or-submit,” after slogans scrawled outside besieged areas by pro-government militiamen. The tactics have succeeded in much smaller areas: in encircled suburbs of the capital, Damascus, and in rebel enclaves in the central city of Homs — first in the historic Old City and, most recently, last week, in the outlying neighborhood of Waer. In the past few days, pro-government forces have signaled that they are escalating efforts to press the tactics to their conclusion in Aleppo, step by step. On Sunday, Syria’s United Nations ambassador punctuated the message, declaring that the government would reclaim all of the city. First came new waves of airstrikes, Aleppo’s worst bombardment of the war. 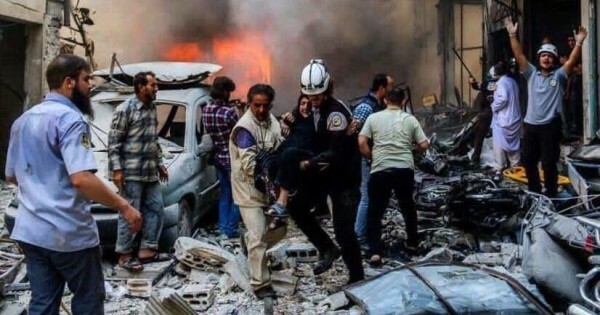 The bombings were so ferocious that the United States and Britain accused Russia of “barbarism” and “war crimes” for backing the Syrian air campaign. More than 90 people died on Friday, and more than 100 on Saturday. At one hospital, nearly half of the 67 people treated for injuries were children. On Sunday, scores in the rebel-held districts were dead by evening. But it was not just the volume of bombs that made the airstrikes devastating. They also hit, one by one, the systems that have kept life inching along. Rescue workers in Aleppo reported that their cars and headquarters were among the first targets hit on Friday. The effect was instant: Now, when people are buried in rubble, no one comes. Or it takes longer for them to arrive. Relatives are again exhuming relatives with their hands. Next, a much deadlier weapon than had been seen before was introduced: a heavy-duty ground-penetrating bomb, known as a bunker-buster. Turning whole buildings into craters yards deep, these bombs also threaten basement shelters and water pipes — not to mention the schools, clinics and even playgrounds built underground over the years to help minimize the damage of airstrikes. As medical workers, rescuers and residents navigate the chaos, every now and then, on their phones, a text message pings, offering help. The texts, from the government, say that Russia is providing aid to people in the government-held side of the city, and is available to any who return to the bosom of the state. The Syrian state news media broadcasts images of the night life on the other side of Aleppo, its lit skyline viewable from the darker rebel side. Those images play down the struggles of people on the government side, who have faced their own suffering with rebel shelling, water shortages and economic collapse. Russia says it has opened safe corridors, and Syrian state television has reported that people have fled through them. Other residents say they have tried to approach the corridors, only to be shot at; each side blames the other for trapping people there. Yet if other places are any indication, some people in East Aleppo may eventually take a deal at any cost. In Homs, in the Damascus suburb of Daraya and elsewhere, fighters and civilians have concluded that they are stuck in a war of attrition. They have agreed either to take their chances in government territory — seeking “regularization” of their status and the clearing of any criminal records, but risking rearrest — or to be bused to rebel-held territory, where they risk further bombing. The groundwork for that kind of choice has been laid in eastern Aleppo. Supplies of food and medicine are thin and intermittent. But in case anyone expected that the agreement between Russia and the United States on delivering aid would bring relief, a week ago a sustained, hourslong aerial attack was carried out on one of the first convoys of United Nations aid trucks permitted to travel under that agreement. The United States has blamed Russia and the Syrian government, which have denied involvement. At the emergency meeting of the Security Council on Sunday, Mr. de Mistura pleaded for diplomats to halt what he called “new heights of horror,” and asked for 48-hour pauses in the fighting for evacuations and humanitarian relief. But what followed was vitriol. Russia remained unbowed and its Western rivals challenged it more aggressively, erasing most of whatever hope remained for diplomatic progress. The Russian side blamed the United States and its allies for unleashing terrorist groups across the Middle East, and even extolled the Syrian government’s behavior. The Council meeting came after months of diplomacy by the United States and Russia collapsed on the sidelines of the General Assembly conclave last week after the convoy assault. Efforts to revive a temporary cessation of hostilities failed, and frustration intensified among American allies that the closed-door negotiations between Washington and Moscow had yielded no relief. Mr. Churkin accused the Americans of having no influence over the rebel groups they backed, and repeated his government’s contention that no cease-fire was possible until all opposition groups distanced themselves from the Nusra Front, the extremist group that now calls itself the Levant Conquest Front and that both Russia and the United States consider a terrorist organization. The American ambassador, Samantha Power, took sharp digs at Mr. Churkin even before he began speaking, saying Russia had tried to blame everyone else and refused to account for its actions. She said “it was not unreasonable to think” that the Russian and Syrian militaries had loaded incendiary bombs aboard warplanes bound for Aleppo even as Russian diplomats at the United Nations talked last week of making peace. Mr. de Mistura said the government was carrying out countless airstrikes on residential buildings and other civilian infrastructure in rebel-held parts of Aleppo — a potential war crime.